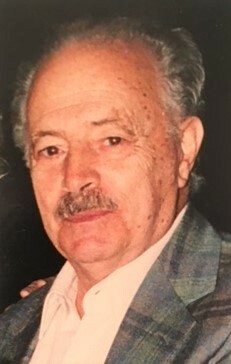 Funeral Services and interment in Woodlawn Cemetery were held on April 12th for Victor J. Staffier, who passed away following a long illness on Tuesday, April 9th. Mr. Staffier died at the Lighthouse Nursing & Care Center of Revere. Born & raised in East Boston, he attended East Boston Schools & was an alumnus of Boston Trade School, Class of 1941. All of his working career was as a Letter Carrier for the U.S. Postal Service, for over 35 years. Mr. Staffier was an exemplary “Family Man”, who thoroughly enjoyed the company & presence of his Family. His late wife of over 50 years, Victoria B. (Angelo) Staffier passed on September 3, 2009. He was the son of the late Emilio & Louise (Giannattasio) Staffier. He is the cherished father of Donna L. Sarmanian & her husband, Michael of Stoneham. He is the devoted grandfather to Jena E. Sarmanian of Stoneham, Lara M. Roche & her husband, Kenneth of Milton & Michael D. Sarmanian of Medford. He is the dear brother to Jennie Garufo of East Boston & the late Angelo J. “Al” Staffier, Michael, Ralph, George, Anthony, Thomas & Tomasina Staffier. He is also lovingly survived by his two 2great-grandaughters, Paige & Caroline Roche, both of Milton, many nieces, nephews, grand-nieces & grand-nephews. Remembrances may be made to the N.E. Center & Home for Veterans, P.O. Box 845257, Boston, MA 02284-5257.